Our new Premium No-Iron Khaki looks as great as it feels. 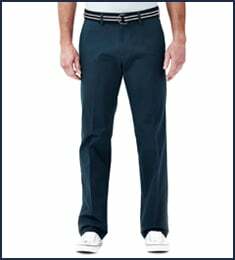 Stretchable cotton-blend fabric, super flex waistband and permanent crease will keep you looking sharp and comfortable. If you like our Work to Weekend khaki, you&apos;ll love this slightly dressier lighter-weight option. Looking great never felt so good. Premium No Iron Khaki Pant is rated 4.5 out of 5 by 31. Rated 3 out of 5 by PG23 from Material Durability! I love the fit and comfort of the No Iron Khaki but durability of the material is not great. I have purchased at least three pairs of these over the past year and I had to throw the last pair in trash yesterday due to a hole, approx 1/2" in diameter, forming under the back pocket. All three have had the same issue in various places. Great pants for the money but will not purchase again. 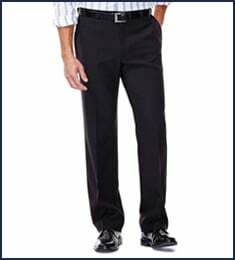 Rated 5 out of 5 by Gene T from Very nice for khaki pants They feel and look like dress pants. Very nice and good looking. Rated 5 out of 5 by Duane73 from Grandson loves them! Fit is perfect. Grandson wears them to school once a week for dress up day! Rated 5 out of 5 by Don F from Wonderful Fit and Great Quality! This review is for the Haggar Men's Premium No Iron Khaki Front Pant in the slim Fit. The pant fit was just as they said on the size chart. The most things I love this pant are the expandable waist band and very deep pockets. The fabric is very soft to touch and very comfortable to wear without being too stretchy. 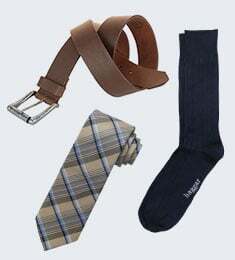 The material is medium weight and fully lined and looks sturdy and well-made. The pant is easy to care for and wrinkle resistant. It's machine washable and, if taken from the dryer when finished, come out smooth and sleek and need no-ironing as the name suggests. Certainly a joy for us who don't like ironing. So far, I'm very satisfied with this pant and will buy this brand again and again. Highly recommended. 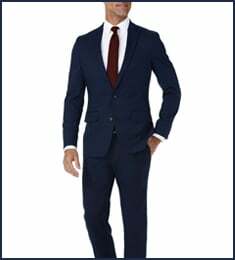 Rated 5 out of 5 by Angie from Great fit and style I usually purchase the classic fit, but my teen son has grown physically and fashionable, thus the request for slim fit. It was a Perfect decision; package arrived just in time for a co-Ed event. What a happy guy! Rated 4 out of 5 by Vikram from Good Fit They fit good. Although sometimes I doubt about the stretch fabric which may get torn over a period of time.